A collaboration between a major business and community groups in Bundaberg has resulted in the delivery of new breastfeeding and baby information packs for new families. 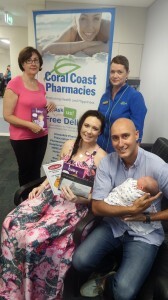 Margaret Wass, Deb Colbourne from Coral Coast Pharmacies with Jessie, Driss and baby Aimira. A funding application by The Bundaberg Health Services Foundation to local business Coral Coast Pharmacies resulted in a donation of $3800 towards the project – not only for new dad’s information manuals but also the Hello Baby Directory which is a local guide to services for families. The Foundation also contributed a further $1422. The project was done in conjunction with the Bundaberg Family and Baby Network (FAB). Foundation Manager Maria Burnet said she was extremely grateful for the enormous financial support contributed by Coral Coast Pharmacies to ensure these packs could continue to support the work being done by midwives and medical teams in the Antenatal Clinic and Family Unit at BundabergHospital. “Raising awareness of the value of breastfeeding through the promotion, education and support of mothers, families, professionals and the wider population in Bundaberg and surrounding areas is vital and assisting in health promotion is a role of the Foundation,’’ Ms Burnet said. Nurse Unit Manager of the Bundaberg Family Unit Dohna Myler said fathers have been identified as a key target area and giving them support and knowledge has shown to be important in both the initiation and continuation of breastfeeding. West Bundaberg Pharmacy Retail Manager, Deb Colbourne said the Coral Coast Pharmacies group could see that this project would be of enormous benefit to new families in ensuring they receive support with their new baby, when they needed it, so immediately provided the financial funding required. Margaret Wass from Bundaberg Family Relationship Centre said that FAB was made up of key service delivery agencies within the Bundaberg region family sector. The network and associated working groups have been operating in the Bundaberg community since 2006. “The aim of FAB is to bring together key partners in order to work together to promote and enhance the heath and wellbeing of families from conception to adulthood,’’ Ms Wass said. The Network took on the facilitation role of the Breastfeeding Network including their project of providing Antenatal with information packs for Dads. It has also been printing and reviewing the Hello Baby Directory since 2006. The Australian Breastfeeding Association also supported the information packs for Dads by providing the envelopes for the packs. This entry was posted on Wednesday, October 29th, 2014 at 3:13 am	and is filed under Uncategorized. You can follow any responses to this entry through the RSS 2.0 feed. Both comments and pings are currently closed.